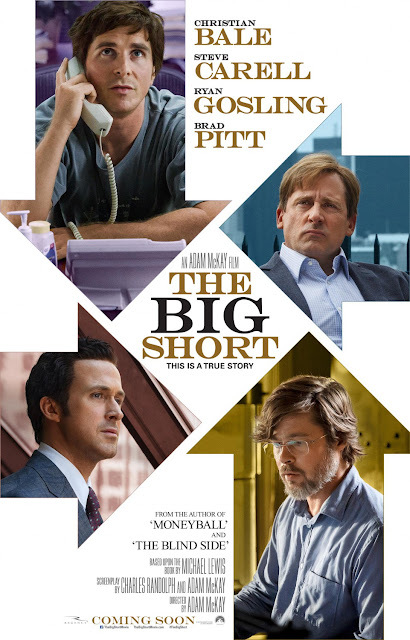 Chrichton's World: Review The Big Short (2015): A very important film. Only fails to make a real impact. Review The Big Short (2015): A very important film. Only fails to make a real impact. The whole world has been impacted by the economic crisis. And this film gives us some insight how it could happen and why it will keep happening if we don't put a stop to it. Don't worry. I am not going to preach how banks are evil and they need to be eradicated. It would not help the cause. Because it is the way we think and live our lives that should change. I don't see that happening as long as we are part from the system. Instead let us talk about if The Big Short is worth your time if you exclude it's message. I personally enjoyed the comedic approach to this difficult topic. As I said the whole world has been impacted in big ways and most of it in very negative manner. It is then almost gutsy to tell us this tale this way. Although it does not shy away from telling the audience what is at stake here. We get introduced to certain characters who apparently are the only ones finding out about certain flaws in the system and who then decide to use it to their advantage. There is a lot of technical mumbo jumbo that will be lost on most of the audience but where if needed will be explained to you like you are a five year old. It is in these moments where the film breaks the fourth wall and where some of the characters talk to the audience directly. I could appreciate this at first but most of the time it almost felt like you were being mocked. Like they had to dumb it down to make you understand. Just because people can't understand the jargon used in a certain profession or business does not mean they are ignorant. At times it felt like the film makers needed to explain things where at other times when it was really needed failed to do so. Also everybody is pretty aware that banks and the big corporations are screwing us. More interesting would be why we let it all happen. Why do we buy into these air bubbles? This does not get answered. Since this story is being told through a couple of characters it would have been nice if we gotten to know more about their background than we did. We are expected to be on their side without actually knowing if they are above and beyond approach. In one of the scenes a woman tells Mark Baum (played by Steve Carrel) that he is a hypocrite and if you think about it all of the characters are. Very rarely do we get to see these characters in surroundings outside of work. Christian Bale as Michael Burry was interesting but nothing we have seen him do before. Ryan Gosling stood out because he did a lot in the very little screen time he had. Although his character was the most honest about what his goal was. To make money. The other ones were supposedly more conscious but also naive. As we are lead to believe they weren't aware that the system is fraudulent and corrupt. Seriously who doesn't know this? Their excuse is that they can't believe the extent of it all. For me it made the characters less credible and with not much depth to them it completely destroyed my sympathy for them. But maybe that is what they were going for. Problem is that even if you are completely oblivious about the crisis (Seriously how can you be? Have you been living in a cave or something?) there is not much else going on cinematic wise. Like Spotlight the whole focus lies on it's message and while it is one that needs to be told it undermines the acting and dramatic events. The Big Short starts out very strong and after 40 minutes or so it becomes apparent that they are already done with the most compelling stuff. It is then that we get exposed some scenes that don't really add to the story but prolong the film artificially. A real shame if you ask me. Especially since this a very important film because of it's message. I expected more from this but I don't think it will make much of an impact because in general people don't care and aren't made to care. They missed the chance to really wow us and present us with some real hard truths to make you think. Why not just show us more of how banks work and how they don't give a damn about anyone else than themselves. What is the reason to keep this from the public? Just give us the dirt and then we can actually make up our minds or get real angry for a change. Overall very deserving of your time because of it's message but don't get your hopes up about it too much. Cinematic wise this is not as strong as it could have been. Where are you Oliver Stone? You should have directed this.